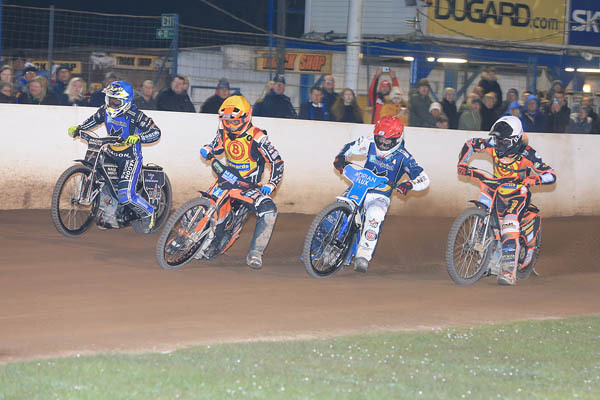 Eastbourne made a superb return to professional speedway tonight (April 6). The Fineprint Eagles beat Birmingham 52-38 in the Championship Shield. Richard Lawson scored a 12-point maximum and captain Edward Kennett a paid maximum (13+2). A crowd of more than a thousand saw some dramatic action as the Eagles bagged three points in this early-season competition. Eastbourne could not have made a better beginning. Ben Morley zipped into the lead in heat one. 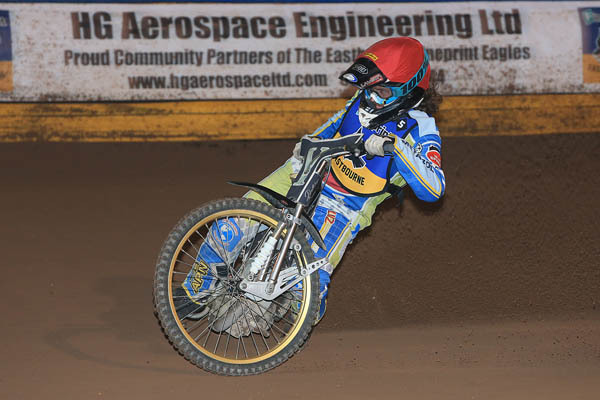 Kennett rode ‘shotgun’ and Eastbourne were off to the perfect start a 5-1 heat win. The visitors gained confidence as the meeting progressed but then they ran into the Eagles’ big guns in the final heats. Lawson and Kennett were supreme and their fellow heatleader, Lewis Kerr, scored four wins before running a third in heat 15. Will Pottinger, who assists co-promoter Trevor Geer with team management, said: “I think we can be satisfied with the win. 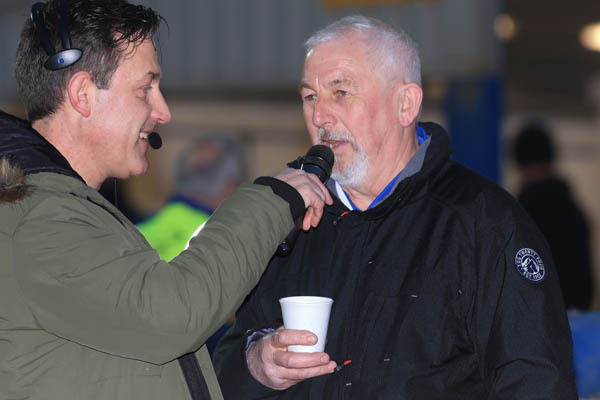 “We sent Birmingham home with no points. He said there was still room for improvement and first-night nerves were now out of the way. He admitted that heat one settled a few nerves for him, and the team. “I haven’t ridden speedway since last June. Helping Ben home for a 5-1 was great and the track rode absolutely fantastic. “Darren [Prodger], Neil [Hollebon and Roy [Prodger] did a great job today and got plenty of water and moisture into it and that made for some great overtaking round the outside,” he said. Tom Brennan, a star of last year’s National League team, scored 7+1 in his first meeting at Championship level. “I had a lot of nerves going into to. Heat two was a nice conservative ride. I think I held my own and came out with a nice consistent score which was what I was aiming for. “There I nothing worse than going win, last, win last. Here’s what our man Kevin Ling made of the return to professional speedway at Arlington. 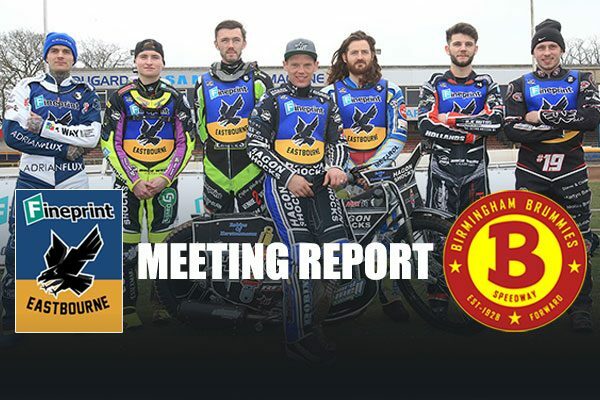 A new era dawned at Arlington stadium as the new look Eastbourne ‘Fineprint’ Eagles kicked off their Championship campaign in style with a stunning victory. 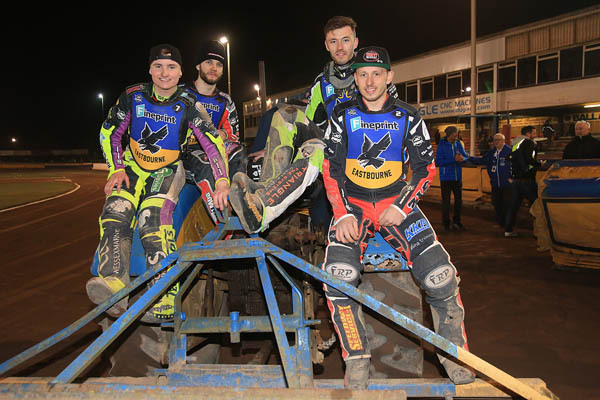 Their 52-38 Championship Shield triumph over the Birmingham Brummies was greeted with delight by a sizeable and wholly encouraging opening night attendance. 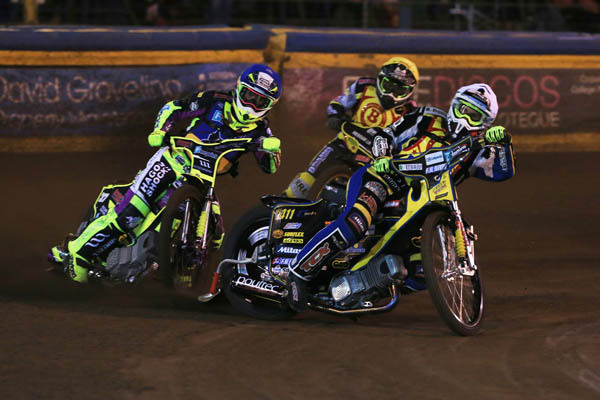 For the Sussex side, Richard Lawson secured a four-ride maximum while recently appointed skipper Edward Kennett also rode unbeaten by an opponent with a paid 15-point maximum. 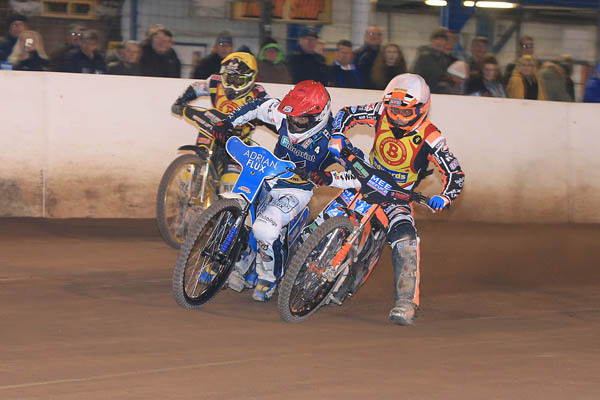 Lewi Kerr also proved an instant hit with the Arlington faithful, his 13-point return only seeing him miss out on a full house as Ashley Morris headed him to the chequered flag in the final race. Tom Brennan also drew plaudits on his home debut at the next level thanks to a creditable paid 8-point showing. For the visitors Zach Wajtknecht provided the chief opposition with 9-points whilst reserve Paco Castagna also impressed; two race wins contained within his paid 9-point tally. The new chapter in Eagles history began with the perfect opening line. Ben Morley hit the front in heat one to become the first Arlington winner of the new era in a time of 58.9. Kennett had his back and he contained the threat of former Eagle Ulrich Ostergaard to secure maximum points and an opening 5-1 for the hosts. Though the home fans might have hoped for a similar outcome as Brennan and Georgie Wood took to the track, Castagna would provide the brakes to their aspiration. The Italian (son of former Eagle Armando) nipped sharply from the start in heat two to lead the duo home (time 58.4), the scores remaining shared as James Shanes ground to a halt on the opening lap. The second running of race three witnessed the first of four straight wins for Kerr (time 58.0) as the Eagles added another 4-2 to take the scores to 12-6. A tight first turn had seen both Alfie Bowtell and Ashley Morris come to grief, the latter being judged accountable and ruled out of the rerun. The volume turned up a notch once again in the fourth as Lawson and Brennan combined to outpace Shanes and Kyle Newman (winning time 58.0), the Eagles at 17-7, moving 10-points to the good. Kerr triumphed for a second time in a restarted race five (time 57.5 – the quickest so far) as he headed home both Ostergaard and Dane Tobias Thomsen. The latter was effectively gifted the point however as Bowtell’s machine failed him on the second bend of lap three. 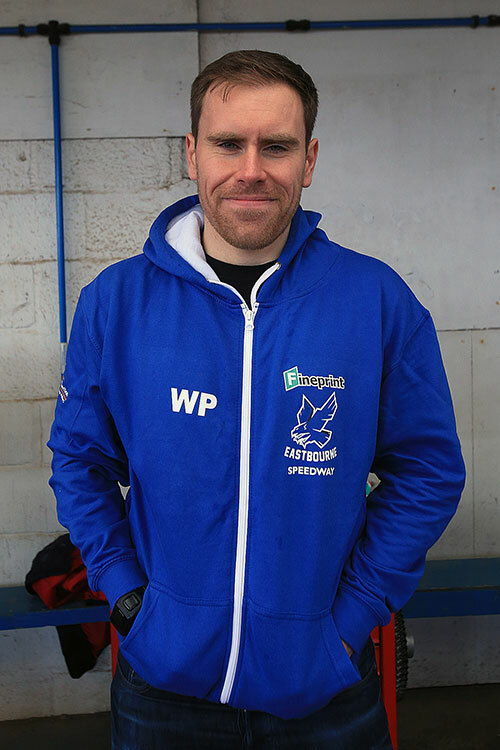 Morley found himself ruled out of heat six as he attempted to round Newman on the third bend with Eagles sitting on a 4-2. In the rerun Kennett was taking no prisoners as he executed a superb inside pass on bend three of lap two to deny early leader Newman and maintain the Eagles 10-point advantage which now stood at 23-13 (winning time 59.0). Lawson was an all the way winner (time 58.9) of race seven but a ragged start from Wood saw him admit second best to both Wajktnecht and Morris despite his close attendance. The Brummies did make some inroads into the home lead in heat eight however. It was destined not to complete the full four laps – the result being called after Brennan piled into the third lap air fence on the pits while giving chase. With Castagna and Thomsen hold the pole positions at the time of the stoppage, the race was duly awarded as a 5-1 to the Brummies and thus the margin reduced to 6-points, 27-21 with seven races still on the card. Kerr’s victory in the ninth (winning time 58.9), ahead of both Newman and Shanes but Bowtell’s troubled evening continued as he again pulled up during lap two. Kennett’s win in race ten (winning time 58.3) took the Eagles into the interval still holding that 6-point advantage, now 33-27, after Wajktnecht and Morris packed the minor places ahead of Morley. Lawson reigned supreme once more in heat eleven (winning time 58.8) as he headed home Ostergaard. 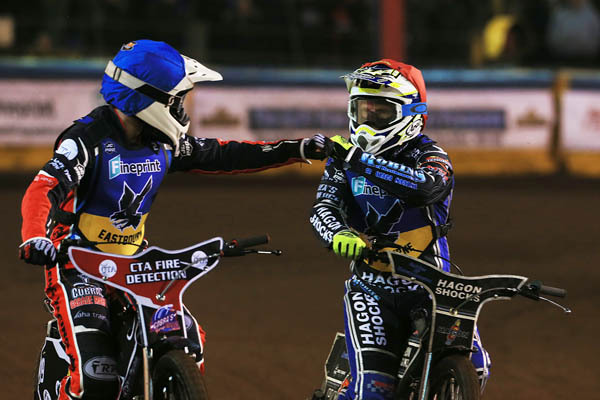 Eastbourne went two further points to the good, 37-29 as Wood secured the odd point after Thomsen suffered a fall and then subsequently retired during lap one. It remained nip and tuck as Birmingham hit back with a 4-2 of their own in the very next race. Wajtknecht secured only their third race win (winning time 59.5) as he outpaced the impressive Brennan and with Castagna similarly getting the better of Bowtell the scoreline narrowed to 39-33 with three races to run. With their top trio of Kennett, Lawson and Kerr as yet unbeaten by an opponent one felt that the hosts were on fairly safe ground, however. 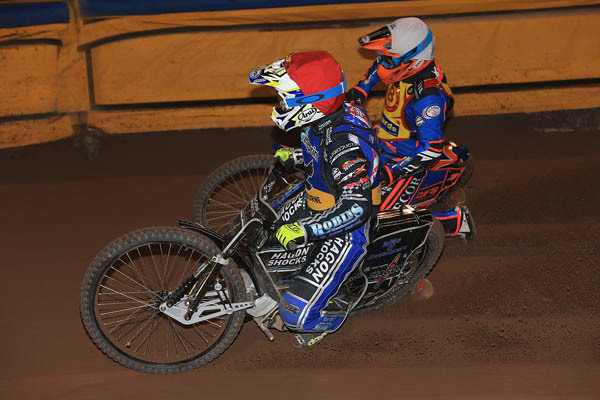 That theory was then borne out in no small way as Lawson and Kennett combined for maximum points over Ostergaard and Newman in heat thirteen (winning time 58.3) to place the Eagles at the threshold of victory, the score now standing at 44-34. The door to the win had been opened and Kerr stepped right through as he wrapped up all three match points with a win over Morris (time 59.2) in the penultimate race. With Brennan also seeing off the challenge of Shanes, the margin now stood at a substantial 12-points, 48-36. Kennett breezed past the fast gating Morris to claim the honours in heat fifteen (winning time 58.3) but try though he might Kerr could not quite find the legs to get past the Brummies rider. Nevertheless, the closing 4-2 saw the final difference stand at 14-points (52-38), a sterling start from the Sussex outfit and a performance that drew rich praise from all in attendance and sent a large and enthusiastic crowd home happy. Race times: We will try and include race times in our reports (both home and away) now that the Speedway Star match details no longer contain this information. Away from home we will have to rely on the public announcements, so do bear with us if some are missed. Next Saturday: Somerset in the Championship Shield, 7.30pm start. Keep tuned into this website news during the week. Eastbourne v Birmingham in the Championship Shield at Arlington Stadium, 8pm. Traffic latest: Avoid the minor road through Pevensey, Westham, Stone Cross – long-term roadworks. A new era dawns at Arlington Stadium tonight. 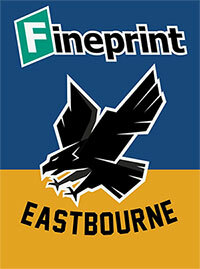 The new look, newly rebranded Eastbourne ‘Fineprint’ Eagles take a leap of faith and step up a level to take on the challenge that speedway’s Championship league racing. A ring of familiarity, it is hoped, will ease them into their new surroundings. First in line to face the Sussex side are fellow newcomers to the middle tier of racing, the Birmingham Brummies. The two teams quickly renew acquaintance after having both contributed to a number of the classic encounters fought at National League level over the last four seasons. Hopes are high that each will have as much to offer as they enter the higher level. 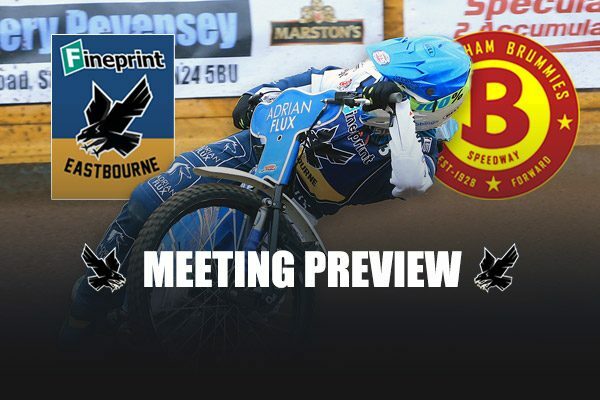 The Eagles and the Brummies are set to do battle for Championship Shield points, the season opening competition that will also see them take on Somerset in the southern area section. The winners of that mini-group will join with the top team in each the Northern and Central Group, together with the highest runners up at the semi-final stage. Following a success laden four-year tenure at the lower level – with seven trophies to show for their efforts – the only way really was up for the Sussex outfit. And that is exactly where they are heading with an all-action, all-British and exciting looking team. Leading the ‘Fineprint’ Eagles into the fray on Saturday (the action set to commence at 8pm) is newly appointed captain Edward Kennett. No one at Arlington will need reminding that the name Kennett is inextricably linked with the Sussex club’s history with Edward’s uncles Gordon and Barney and father David having also represented the side with such distinction in the past. It seems somehow fitting that such a name should lead the Sussex men into the new era. 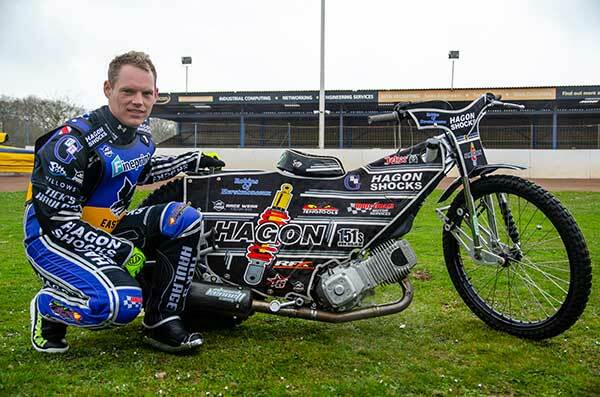 Kennett forms a powerful looking heat leader trio alongside Richard Lawson and Lewi Kerr. National League leading lights Ben Morley and Alfie Bowtell, who last year also rode at this level, form the engine room of the team. Each young man will, of course, be hoping that the Sussex club will be the best place to nurture the next stage of their development. All eyes will surely be on the reserve berth of the Eastbourne side ,however. Both Georgie Wood and Tom Brennan played a huge part in the Eagles’ double winning success last season and the Arlington supporters will be hoping that their respective upward mobility will continue now that they have been handed their opportunity at the next level with their home club. Quite obviously the Sussex outfit will look to kick their new campaign, and new chapter off with a handsome win. Under no circumstances, however, will they be taking their opponents lightly. Former Eagle Ulrich Ostergaard leads the Brummies’ assault and he will have solid back from the likes of Kyle Newman and Ashley Morris. Both Zach Wajtknecht and James Shanes will be familiar faces to the Arlington faithful from their National League days. The Red and Yellow attack is completed by cosmopolitan duo, Dane Tobias Thomsen and Italian Paco Castagna. Brummies: Paco Castagna, Ashley Morris, Kyle Newman, Ulrich Ostergaard, James Shanes, Tobias Thomsen, Zach Wajtknecht.